Tune Up Music Class at Seoul Dasom School"
students of the Tune Up Music Class! Newly launched "Music Concert for the First Semester of Tune Up Music Class at Seoul Dasom School"
The Music Concert for the First Semester of Tune Up Music Class at Seoul Dasom School is a new educational program that was launched this semester. 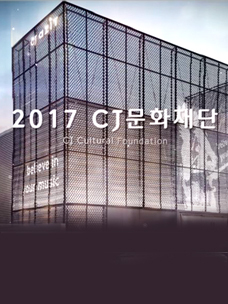 This is big news for students who have had a chance to display their talents during the year-end performances held at CJ Azit Gwangheungchang every year. Given the relatively short preparation time compared to the year-end performances, the students would have been a bit nervous. However, it was all alright on the night, with the music concert offering a chance for students to express their gratitude to their teachers and classmates for the time they shared together and for finishing the semester well. A photo zone was built in the front lobby of a large auditorium at Seoul Dasom School to hold the Music Concert for the First Semester of Tune Up Music Class. We saw students taking a commemorative photograph while playing cheerful jokes on their friends. It was an exciting time for students who had experienced music and learned musical instruments through the Tune Up Music Class. Each student who entered the concert hall was happy to be given a raffle ticket and small gift. Next, it was time for them to show off the abilities they had developed over the semester. Students who didn't come up onto the stage were able to enjoy the performances. Meanwhile, light refreshments were served at the lobby of the large auditorium. Students and teachers shared conversations over pizza. Teachers expressed their gratitude to the students for following what they had taught. That made us feel all warm inside. Time for showing off your musical talent! a big applause from the audience. The team coming to the first stage was a group from an acoustic guitar class together with Kim, the host and the vocalist of Number Nine. The students played "Cherry Blossom Ending" by Busker Busker, with a passionate guitar riff. There was a beautiful musical harmony heard in the collaboration with Kim. 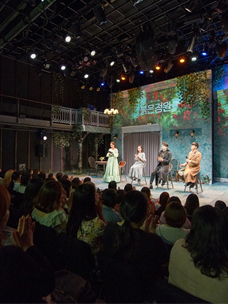 Next was the joint performance created by students from a vocal class and acoustic guitar class playing and singing "Yeosu Night Sea" by Busker Busker. The audience was enthusiastic about the guitar performance by Lee Seung-jin, a vocalist and guitarist of 24 Hours, Tune Up's eighth band, which brought a beautiful feel to the proceedings. In addition, students from a vocal class cheerfully sang "Butterfly" by Loveholics. The fantastic harmonies the students achieved were greeted with loud cheers and applause from the audience. The one-hour-and-a-half of stage finished before we knew it. We could feel many students' endeavors to deliver great performances from "Twinkle" by Girls' Generation-TTS to "See Through" by Primary, and the full support of teachers from the vocal class. 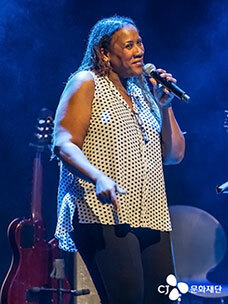 Mun Deug, one of the teachers, sang "Ivy Flower," a song by Mahogany King, which captivated the hearts of the audience. Since Mun Deug composed the song specially to cheer on students at Seoul Dasom School, many students listened carefully to the song. After the performances by students, there was a grand finale. This was a chance for Tune Up Musicians to celebrate the first performances by the students. 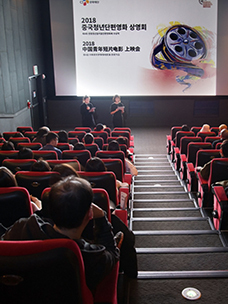 A person appeared on stage with a bright smile among the nervous students. She was Tune Up's fourth musician Lee Jeong-ah, and she taught students in a vocal class for this semester. Her performance was the perfect addition to this music concert. Her song "Hold On" contained the meaning of following one’s passion towards one’s dream and always having a love for life. The song's message, together with her clear voice, impressed the audience deeply. Beauty Handsome, Tune Up's 15th band, made the finale of this show. James King and Gwak Jin-seok, the keyboardist and drummer of the band were together with students as teachers this semester. Two musicians said that that they felt that having such a special time with students healed their minds. Beauty Handsome's cheerful and exciting songs sent the audience into raptures. The audience shouted "Encore!" again and again. From "Can’t Stop Loving You" to "Because I Love You," we could feel the charm of Beauty Handsome. Q. What are your thoughts on teaching students at Seoul Dasom School? A. I have never taught such young students. Having seen their approach to music, I was able to think about many things. Most of all, I feel so rewarded to have finished the class and put students' concert on stage. Q. How do you feel days before the music concert for the first semester? A. My students have prepared for the concert enthusiastically. Many students practiced hard by themselves. The concert is such a meaningful event for students and I’m so proud of what they have achieved. Q. Do you have any regrets about the preparation for the concert? A. I guess my one regret was that all the students weren’t able to come onto the stage. There were many students who learned to drum, but only two of them were selected for the show. I regret this. It would have been much better to allow all students on stage. Q. Let me know the most pleasant memory you had during class. A. We had a class once a week. I find it interesting to see students improving themselves over the course of the week. The students were happy to play music and so was I. It was great being able to share knowledge and experience. Q. Do you have any message for students preparing for their own music concert? A. I would urge them to think "There are many things to enjoy!" and "Life is wonderful!" after the concert. In addition, I hope they can appreciate the simple things in life. Q. Would you agree that teachers also learned something during the class? A. I found that many students approached music in a different way to me. For many students, music is like the air that they breathe. For me, I struggled to find the determination to make a success of music; but for the students, playing and expressing themselves with music came naturally. This made all us question our old assumptions. I hope that students can continue to learn and experience music in the second semester. Q. What did you learn from Tune Up Music Class? A. Hello! I'm Choo Yu-lyn from the vocal class. I loved singing songs to myself, but I never thought I could sing that well. The thing was, I had no confidence in my singing ability. However, attending the class really helped me to build my confidence. Now, when I go to karaoke with my friends, I can sing more confidently. Q. What's your favorite song? A. My favorite song is "Yeosu Night Sea" by Busker Busker. I will sing the song for today's concert. Hope you will be there to cheer me on. Q. What was the thing you remember most about preparing for the concert? A. I learned many things from my teachers. They stayed with us till late in the evening to make sure we were well prepared for the concert, even the class had long since finished. I’m really glad to have had their support. Q. How do you feel about going up on stage? A. It was great, even though I was a bit nervous about having to show some of the things we had learned during the semester. I am worried that I would make a mistake on stage, but I try to keep myself confident. Q. What words would you like to share with your friends and teachers who have been with you on this journey? A. Today is the day we were finally able to sing the songs that we have practiced over the semester. I hope we can work with each other to create a great performance. I really appreciate the way the teachers really took the time to make sure we could do our best. I'll make sure to give it my all on stage for them.